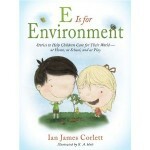 Thank you to everyone who left comments about E is for Environment. Carol C and Tracy B each won copies of the book! Be sure to watch for future book giveaways, guest posts and contests. E is for Environment by Ian James Corlett Earth Smart How to Take Care of the Environment is great for grade 2 Contact We Planted a Tree and Made a Difference to the Environment A Book Giveaway & Easy Green “Actions” For Families To Try Together!